We manufacture bespoke wooden staircase spindles & parts including treads, risers, handrails, balusters, newel posts, newel caps, spindles and base rails in all sorts of shapes, designs and sizes. We can supply half newels, double top newels, stair box newels, carved newel posts, burbridge spindles, oak spindles and newels, or unique designs to suit your requirements. Our bespoke wooden porch columns can be made to any size or design. We can match existing porch columns or produce unique designs. All our wooden columns are hand made in our Sussex workshops. Our gallery shows just a small taster of the range of decorative pieces we can produce. This includes tables, urns, bowls & vessels, carriage clocks & bespoke items. We can produce hardwood dowel any size from 20mm up to 65mm. We can turn them from in any hardwood including ash, oak, walnut & iroko. The dowels we make are used for a wide range of applications including curtain poles etc. We are happy to hear from those who might have an bespoke wooden project in mind that differs from those we are typically requested to make. Barley Wood manufactures custom wooden staircases, kitchens and other hand crafted and machined solutions for your home. Established for over 20 years Barley Wood has been supplying top quality spindles, newels, newel caps and other staircase parts custom designed, or built to your particular specification from your design. It doesn’t end there though! 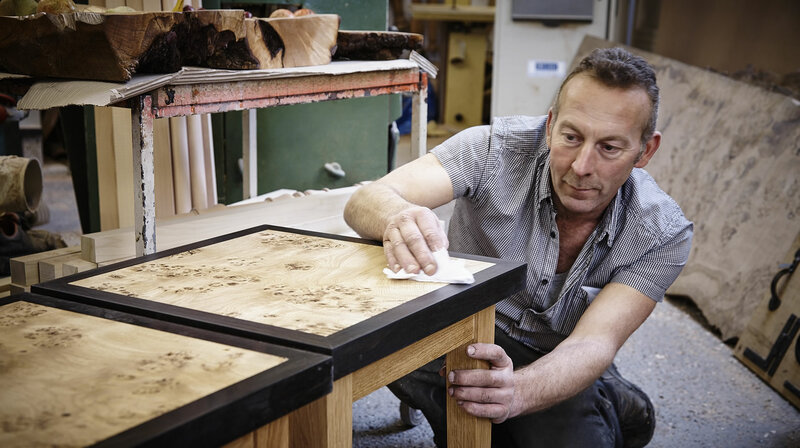 As a specialist woodsman, Mike Dean, the owner, is able to manufacture any requirement you might have, new, old or if you have a restoration project, a copy of an original damaged part. Barley Wood is Mike Dean (And his staff), a specialist wood-turner working in Westfield, East Sussex in the heart of the English countryside. Barley Wood has two main areas of business and the first of those is the corporate work providing services to builders, joinery companies, home owners and architects. Barley Wood supply complete staircases, newels, spindles, curtain poles, porch columns, kitchens and any custom requirement a builder may need. In fact, if it can be turned on a lathe, Barley Wood can supply it! The second area of Barley Wood’s business is the custom, bespoke wood-turning undertaken by Barley Wood owner Mike Dean. Ever since he was a boy he has been turning wood and he has been commissioned by many well known figures including Tommy Walsh and Elton John! Mike Dean is a specialist wood-turner and he accepts commissions for all sorts of different projects. In the video on the left is a (very long!) first cut of Mike making a 3ft high mushroom for a client, The Wild Mushroom Restaurant in Westfield, East Sussex. Mike has also created plates, bowls and bespoke clocks by hand. Other specialties are decorative items such as urns, vases and jewellery boxes. Some of his plates are so highly prized they have been sold in London for in excess of £4,000! Barley Wood offers a vast array of exciting and unlimited possibilities in wood, so if you would like to discuss your own ideas please get in touch – Mike would love to hear from you. Our bespoke custom staircase Spindles, parts, newel posts, porch columns & wooden decorative pieces service extends throughout Sussex, Kent the South East & across the whole of the UK.